Last month marked the announcement of a special collaboration between Tekken 7: Fated Retribution and New Japan Pro Wrestling, with a teaser video of King's special attire based on the ring gear of IWGP Champion Kazuchika Okada. More details are revealed in the video below. 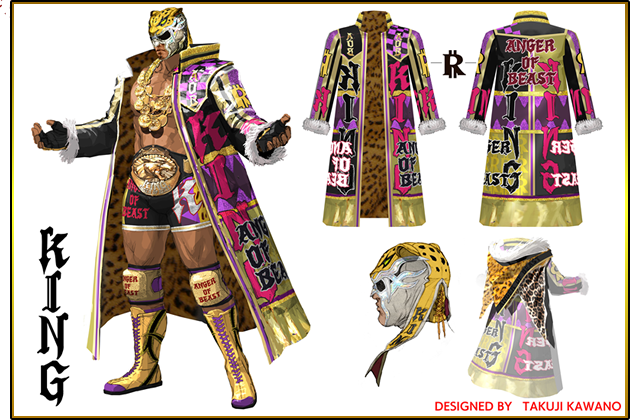 Along with the ring gear, King also obtains a new Rage Art exclusive with the costume, and it's none other than Okada's finishing move, "The Rainmaker"! TEKKEN x NJPW, Bullet Club and CHAOS T-shirts are also made available as customization items for the other characters. Okada himself was present during a special NJPW event featuring the game, where he got to play as King wearing his attire against fellow NJPW wrestler Gedo, who played as Steve Fox. Both wore the official "Rain Maker x Tekken King" T-shirts during the event. There is no word yet as to whether the shirt will be on sale or included in a special bundle when the game is released for the consoles. Tekken 7 is scheduled for an early 2017 release for the PlayStation 4, Xbox One, and Steam. Capcom, in partnership with Marza Animation Planet, has released the trailer for the latest installment to the Resident Evil/Biohazard 3D-animated film series, entitled Resident Evil: Vendetta (Biohazard Vendetta in Japan). Leon S. Kennedy returns to the movie, this time joined by fellow game series veterans Chris Redfield and Rebecca Chambers. They face a new enemy named Glenn Arias, who threatens to unleash a new virus that can create BOWs (bio-organic weapons) that distinguish allies from enemies, making them effective weapons of terrorism. Directed by Takanori Tsujimoto, executived produced by Takashi Shimizu, and supervised by Hiroyuki Kobayashi, the film is slated for release in spring of 2017. The Tekken Channel has recently posted two Tekken 7-related video updates: first is the gameplay trailer for the console version, featuring the returning animal fighters Kuma and Panda; second is a promotional video on the upcoming collaboration project between Tekken 7: Fated Retribution and New Japan Pro Wrestling. Check out the two videos and screenshots after the break. Jimmy Fallon was one big happy gamer geek when Reggie Fils-Aimé, the president and CEO of Nintendo of America, appeared on his late-night talk show--not only to let him test play the upcoming iOS game Super Mario Run, but also to let him have the honor of being the first one to experience playing The Legend of Zelda: Breath of the Wild on the their next-gen console, the Nintendo Switch--in the presence of no less than the legendary creator of Zelda, Donkey Kong, and Mario himself, Shigeru Miyamoto! See Jimmy geek out in the video below. If that wasn't enough, Miyamoto-san even joined The Roots in playing the classic overworld theme song of Super Mario Bros.! The child in me who grew up with Nintendo and Mario is delighted. Capcom looked to redeem itself and wow the crowd in this year's PlayStation Experience (PSX) at the Anaheim Convention Center with two major reveals: First, a much-awaited character is finally making his return in Street Fighter V, and second, a new installment to the Marvel vs. Capcom series is going to be released next year! The brawling Spaniard Miguel Caballero Rojo is scheduled to make is return in Tekken 7, and he's got an unfinished business with Jin Kazama in this gameplay trailer! Tekken 7 is schedule for release in early 2017 for the PlayStation 4, Xbox One and Steam. Not only did Fil-Am wrestler T.J. Perkins represent the Philippines in the WWE's first-ever Cruiserweight Classic and best 31 other cruiserweight wrestlers to win the CWC trophy; his victory also earned him the right to become the new WWE Cruiserweight Champion! Paul "Triple H" Levesque, WWE's Executive Vice President of Talent, Live Events and Creative, entered the ring before the final match between him and Mexico's Gran Metalik (Mascara Dorada), revealing that apart from winning the CWC trophy, the winner would also head to Monday Night Raw as the first-ever WWE Cruiserweight Champion. TJP would go on to make Metalik tap out to his submission finisher to become the inaugural champion, but not before outlasting the odds-on favorite, Japan's Kota Ibushi, in the semi-finals. He also defeated Da Mack, Johnny Gargano and Rich Swann in the early stages of the tournament that also included WWE veterans Tajiri and Brian Kendrick. This is bigger than me; this is not one person, this is 32 people, all of them--every single one of them," says Perkins during his post-finals interview, referring to the CWC trophy. "I started and they were just my peers. And tonight, at the end of this, every single one of them are also my heroes. This is for everyone!" TJP is the first-ever WWE Cruiserweight Champion in nine years since the original title WWE acquired from WCW was discontinued in 2007. As a Filipino wrestling enthusiast, this news inspires me a lot. I look forward to the next Episode of Raw. Here's a little glimpse of how The King of Fighters' darling kunoichi Mai Shiranui will play in Dead or Alive 5 Ultimate: Arcade and Dead or Alive 5: Last Round. Her familiar moves from her origin game translate smoothly in the DOA engine, and can be performed as they are in KOF. Some of her special moves are also incorporated in her DOA-esque combo strings. Check out her gameplay videos below. Mai also receives five alternate costumes: cheerleader, nurse, maid, bunny girl and Santa girl. Meanwhile, selected DOA girls will get alternate attires worn by KOF girls Kasumi Todoh, Yuri Sakazaki and Hinako Shijo! While Street Fighter V's story mode featured post-launch character Urien as a playable character (if only for a few battles), his official gameplay trailer would only be revealed last week. Juri, who was also playable in the story mode before her official release, became available for download last month. Check out their gameplay trailers. Juri is still as vicious as she was in Street Fighter IV. She dons a new look, wearing a biker suit and an eyepatch that conceals her Feng Shui Engine, her V-Trigger that when activated lets her cancel her standard attacks allowing her to chain together moves. In her V-Skill, Kasatsushu, she charges up and kick her opponent from behind; the move can be cancelled just before the back strike, and she retains her charge level. Her new Critical Art, Sakkai Fuhazan, is a multi-hitting projectile move that loses power the farther the target is. This game's incarnation of Urien has him wearing a sharp-looking suit, but a recently discovered Easter egg reveals that you can play as him wearing his familiar loincloth from Street Fighter III when you hold certain buttons during the loading screen before the pre-fight intros. He retains most of his SFIII moves with the exception of his Super Arts. His trademark Aegis Reflector is now his V-Trigger, and still works the way it did before; with a full V-meter, Urien unleashes two Aegis Reflectors. In his V-Skill, Metallic Aura, he laughs hysterically while his skin darkens, and his Metallic Sphere can absorb one attack while he's in this state. Urien's Critical Art is called Dominate Crush, where he unleashes a pillar of dark aura resembling one of his win poses in SFIII, hitting his opponent vertically in a short radius. Urien was released on September 23. And with Juri's and Urien's reveal, SFV's roster is apparently complete. Hopefully though, they unveil a second batch of characters, because there are lots of gamers hoping Gouki/Akuma, Ingrid, Sagat, and perhaps a character from Rival Schools would return in it. The Rio Olympics has just wrapped up in an epic way, thanks to Japanese prime minister Shinzo Abe. His involvement in the closing ceremonies of the Olympics is something that won't be forgotten soon, when he appeared in the video presentation revealing that Tokyo will be the next host city for the 2020 Olympics. The same video also featured cameo appearances by Japanese Olympic icons as well as anime and video game icons such as Hello Kitty, Captain Tsubasa, Pac-Man and Doraemon. Abe was depicted as being still in Tokyo, running late for the closing ceremonies in Rio. He "transformed" into Super Mario and ran in the hopes that he'll make it in time. Doraemon went to the rescue, bringing out a warp pipe for Mario to cross to the other side of the globe. And from the pipe at the arena in Rio came out the prime minister himself, dressed up as the video game icon, much to the delight of the spectators. Who will be the one to light up the Olympic torch when the time comes? Will it be Sonic the Hedgehog? Or perhaps Son Goku? Or will it be Rockman? Or Ryu? All we can do is wait four more years. I never thought I'd see the day when Mario and Doraemon appear together in one video; what a time to be alive!